I think back to my first school principal 15 years ago, who was extremely kind, and how he probably would have been more than happy to assist me with any accommodations I needed. But I was afraid to ask and too proud to admit when I struggled, which really took a toll on my happiness and even health. I remember a particularly devastating moment during my first year of teaching. We were doing “student-led” conferences where the 7th grade teachers floated from table to table to meet with students and parents to discuss student progress. I kept waiting for one of my more challenging students to arrive with his parents so that we could discuss some behavioral issues. I never saw the student nor his parents, so I just kept floating from table to table and assumed the family was a no-show. At the end of the evening, our school’s dean said he’d like to talk with me. He told me that RJ and his parents had come to his office to voice a complaint that I had purposely ignored them and walked past the table they were sitting at during the conferences. I was stunned and awkwardly explained to the dean that I hadn’t seen them, which I knew sounded crazy. How could an entire table of people be outside of my line of vision? I asked him why they hadn’t just come up to me, and he said that he even offered to walk them back in to find me but they were too upset. I remember sitting alone in my classroom after the dean left, hot tears of shame and anger slowly trickling down my face as I recounted the evening, wondering if I had unknowingly skipped over any other students due to my lack of sight. I hated that my actions (or lack thereof) were so misunderstood. I later called the parents to apologize, but they seemed to have already pegged me as uncaring and incompetent by that point. It took me a long time to even tell my team of teachers what had happened, but once I did they made a habit of whispering which students and parents were waiting at tables. But I still dreaded those evenings. Thinking of them now, I wish I had thought to simply ask if I could be seated at a table, or even in my classroom, and have the families come to me instead. Yes, that would have required our team and school to adjust how we were running conferences, but it’s a very reasonable accommodation that would have prevented both misunderstandings and stress. Today, I am able to ask for what I need more easily. For example, I was struggling with some of our forms, particularly the handwritten ones since my screen-reader does not read handwriting, so I asked my director if one of the admins on our teams could read them to me. She was happy to help and even offered that they type the top portions of my forms. This isn’t to say I’ve completely figured out how to handle vision loss in the workplace. Far from it. New challenges continue to arise, and I have to figure out how to navigate them. After my first couple weeks of implementing 504 Plans, for example, I received an e-mail listing some errors in several plans I had finalized and sent to our filing clerk. This might not sound like a very big deal, but these were documents that had already been signed by staff and parents and filed in cumulative student records. In order to correct them, I had to re-upload documents, obtain new signatures and have clerks reprint and refile documents. My oversights cost other employees extra time and effort, which is not even close to the quality work I desire to do. And it sent me immediately into a shame spiral. Fortunately, thanks to Brene Brown and my “Daring Sisters,” I now have some shame-resiliency tools to help me work through blind shame, something I didn’t have in my 20s. Vulnerability is one of these tools, so I was able to share my struggles with a close friend who also has vision loss. She put words to my feelings, saying that my performance didn’t feel consistent with how I would want to perform if I had full sight. I also opened up to a co-worker, who not only offered to start peer-editing my 504 plans but also took the time to empathize and said, “You’re an asset to this team. You bring something that some of us don’t have.” I smiled when she said this because I immediately thought back to the first time I received an e-mail from a teacher and parent of a student with a visual impairment. I couldn’t wait to help a student in an area where I have firsthand experience. But I’ve noticed that it’s not just students with vision loss that I feel grateful to assist. I feel rewarded every time I put an accommodation in place that I know will help a student engage with learning in a way that fosters confidence, regardless of their disability. My director is working with me to find less cumbersome ways to do my job, including having someone proof my forms for typos. It’s not that I’m not able to spot typos, but I’m not able to “spot check” a document or quickly scan over it like most people can. My screen reader is picky about what types of documents it will read, and it doesn’t always read everything that’s on the screen. Staring at pages and pages of typed documents with intermittent gray boxes causes me a lot of eye fatigue and headaches, so we’re working on ways to streamline the process. The irony of trying to figure out my own accommodations in order to put accommodations into place for students is not lost on me. I think back to my years as a student and remember teachers telling my parents that I needed to speak up and ask for help, which always confused me because I often didn’t know what I needed. Now, after years in the classroom, both as a student and a teacher, I’m finding my stride. I’m learning to celebrate the new tasks I have mastered – as small as they might seem at times. I am learning not to compare myself to my co-workers, as they seem to master new things more quickly and with more ease. I’m struggling at times, but I’m not allowing my struggles to shame me. Photo description: water-style script type font with Brene Brown quote mentioned. A friend sent me a framed Brene Brown quote for my birthday that says, “I will not shrink back. I will not puff up. I will stand my sacred ground.” It now hangs over my work desk so that I can glance up at it as a reminder before my meetings. I visualize the name of the student and their needs, and pray for guidance on how to best help them. I know I may not immediately have all the answers for them, but I at least want to start at a place of empathy and understanding. I’m learning that the more practice I have at standing my own “sacred ground,” the more capable I am of encouraging others to do the same. I was, of course, excited by the flexibility of the new position and how many of the meetings would be done virtually. What I hadn’t accounted for, however, were the many pieces of technology I would need to familiarize myself with in order to conduct these meetings. When I shadowed my first meeting and saw the experienced support coordinator sharing her computer screen and clicking from resource to resource using her mouse, seamlessly demonstrating extremely visual techniques and interventions, my first thought was “how will I EVER be able to confidently lead an interactive meeting like this?” I doubted my ability to even log in correctly, much less share the proper materials with parents. And my nerves turned to cold sweats when I held a practice meeting with one of my co-workers and mistakenly clicked on my text messages after hitting “share screen,” promptly lighting up my shared screen with all of my personal text messages. “Um, maybe you don’t have to share your screen during meetings,” she offered. I could tell she was nervous for me. “Ugh”, I laughed, mortified, “I’ll keep working on it before I do an actual meeting.” And I did. I practiced with my assistive tech trainer. I practiced with my husband. I practiced with imaginary meeting attendants. I came up with techniques to ensure nothing else even appear except the exact document I needed to share, closing every single item on my computer prior to practice meetings (which, if looking at my desktop on any given day, is A LOT of windows!). Nonetheless, nervous adrenaline pulsed through my entire body as I logged into my first virtual 504 meeting. The aspect I was most nervous about was how large I had to blow up the accommodations in order to see them well enough to read aloud because it meant that the parent would also have to read a super enlarged version that caused parts of the plan to disappear off the screen. I was also nervous I wouldn’t be able to find it on the desktop or that I would read it in a stammering way, as my fields of vision are so narrow that I really only see one word— and sometimes even one letter— at a time. I went over and over the accommodations in my mind beforehand so that I could paraphrase some of them and not have to read word for word. And when it came time to share my screen, I took my time even though I felt self-conscious about making everyone in the meeting wait in awkward silence as I focused on choosing the correct document. I zoomed in as much as possible, just to glance over a couple of the words, and then paraphrased each accommodation as the parent read along. I have been leading these meetings for the past month, and I have moments where I think “holy cow, I’m doing it!” I’m sharing my screen, moving seamlessly through Google Docs, and using technology in ways that felt impossible a couple months ago. And I’m allowing myself to celebrate those moments of success, something I really didn’t take the time to do in my early working years. I honestly don’t think I was even aware of the beautiful ways I developed to compensate for vision loss in the workplace in my 20s. I felt ashamed of doing things differently, of using non-visual techniques and of admitting that I needed accommodations. I didn’t like to admit that most tasks take me longer. It sometimes feels embarrassing to celebrate acquiring new skills that seem very simple to others. But I think it’s absolutely essential to acknowledge small victories, as they bring awareness to growth. When we don’t recognize growth, we can begin to feel like we are forever striving but never really getting anywhere because there is so much to learn. The white cane continues to be a sign of independence for the blind community. White canes also continue to baffle the public. That’s why October 15th, White Cane Awareness Day, is an important day to dispel myths and provide information on what the white cane is all about. Q: If someone has a white cane, does it mean they need help? 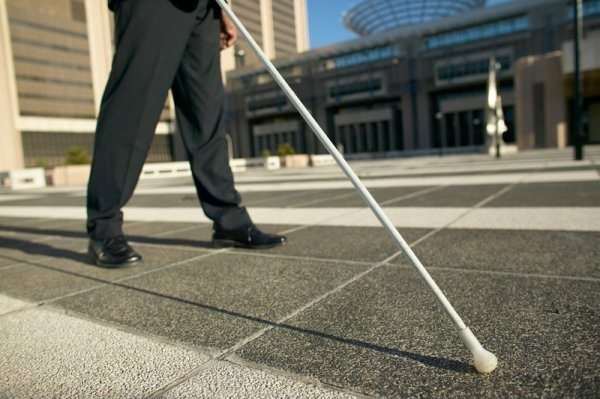 A: People with vision loss use white canes to navigate independently. A person using a white cane is less likely to need assistance because the white cane is used to locate and avoid obstacles. It is best not to assume that someone needs help, but rather offer assistance if you feel inclined and be respectful if they do not want assistance. Q: That person is using a white cane, and now they are reading a book. Does this mean they are pretending to be blind? A: Vision loss comes in many different forms, requiring different adaptations. Some people who use white canes have peripheral vision loss which makes navigating safely without a white cane challenging, but maintain central vision which allows them to see print and recognize faces and objects using their central vision. Q: Why are the white canes so long? A: The length of the cane is important because it signals to the user what is happening several steps ahead of them. If the cane is too short, the user will not have enough warning that a curb or staircase is ahead. Please let us know if you have more questions or comments about white canes! Photo Description: Picture shows a person’s legs walking with a white cane navigating ahead. Are you a woman with vision loss? If yes, we invite you to join us September 20-23 in Park City, Utah for a unique retreat experience. We attended retreats in 2016 and 2017, and loved connecting with our tribe. This year, Jenelle is thrilled to be part of planning and facilitating the 2018 retreat. WHY ATTEND A RETREAT SPECIFICALLY FOR WOMEN WHO ARE BLIND OR EXPERIENCING VISION LOSS? Thoughtful, research-based processes will lead us through identifying where we want to show up in our life and what is holding us back. We will spend time exploring courage, vulnerability, shame, and worthiness. Mindfulness, Self-compassion and other tools. Activities. We will be hiking, challenging ourselves in a ropes course, horseback riding, biking, and plenty of time to enjoy the beauty in Park City at the beautiful National Ability Center. Connection. Retreats bring together women facing challenges of living with vision loss while balancing the demands of family, friends, work and community. At the retreat, blindness becomes a common trait so participants can put away emotional armor and connect with peers without having to explain or educate on blindness. Support. Share struggles and changes in your life with the group without judgment. Build friendship and extend support to other women along this emotional, mental, and even physical journey. Professional facilitators. Becky Andrews, LCMHC, who is blind from Retinitis Pigmentosa, Lisa Bradford, LCSW are engaging and experienced therapists who will lead you through tough discussions and activities with compassion. You can find more information about them at: www.resilientsolutionsinc.com. We are thrilled to have Jenelle Landgraf, MSW student and co-author of doublevisionblog.com, who also has Retinitis Pigmentosa joining us as one of our facilitators. She will also be leading us in yoga each morning. Life-changing experiences. The time spent at the retreat creates a lasting impact that will stay with you as you move forward in your life with family, friends, work and community. Open up to the stories we tell ourselves and gain an empowered outlook with the connections and activities at the National Ability Center. Connect with other men and women living with blindness without judgment. Discover valuable tools to deal with loss and uncertainty, and develop shame resistance. Choose authenticity and write the ending to your story. Just a quick post to share the happy news that I was awarded a first place scholarship from the National Federation of the Blind (NFB) of Washington State. Photo Description: Marci Carpenter, President of NFBW and Jenelle Landgraf posing for a picture at the Evening Banquet. Last weekend I attended the NFB’s state convention in Olympia, WA. I was invited to attend as a scholarship finalist after applying for the scholarship program in early fall. It was exciting to meet the other scholarship finalist, Jennifer Rotz, who is pursuing a degree in Education and hopes to teach at the Washington State School for the Blind. I was instantly impressed by Jennifer’s resilient spirit and passion for teaching children. There is so much more I’d like to share about the convention, but this grad student needs to get back to studying! On October 15th, we recognized “National White Cane Safety Day”. In honor of this day, I wrote an article about my first time using a white cane that was published in The Mighty, and I wanted to share it with our readers as well. Everyone remembers their first time. For some, it comes naturally and they get the hang of it quickly. For others, it’s awkward in the beginning and takes some practice. I’m talking about using a white cane, of course. My cane trainer and I had arranged to meet at a Starbucks in West Seattle, so my husband dropped me off on his way to work. I watched through the window as another car pulled into the space where his Prius had just been. A lady who looked to be about my age, in her mid 30s, stepped out wearing a cute professional-looking outfit with pretty long brown hair she had likely curled at the ends with hot rollers. She glided casually into the coffee shop to order her beverage, and I felt terribly envious of this stranger. While I sat waiting to meet my cane trainer due to my deteriorating peripheral vision, I imagined her on her way to some fabulous job looking perfectly put together, and driving her own car wherever she pleased. Her carefree independence stood in stark contrast to my need for a tool that would help me to navigate. I glared inwardly, recalling the diagnosis of retinitis pigmentosa at a young age, a disease that slowly takes away peripheral vision leading ultimately to complete blindness. I pushed the angry thoughts away as I pictured my two young children waiting for me at home, needing an independent and confident mommy to care for them. I decided to check my email on my phone to distract myself from my jealousy. As I scrolled through emails, I heard a tapping sound behind me. My trainer, Marci, said I would be able to recognize her right away because of her long cane that would be tapping along. I quickly jumped to my feet, turned toward the woman holding the long stick and said, “Marci?” The woman ignored me, and chatted with another woman about the busy morning. My eyes traveled down to the bottom of the stick, and I realized it was a broom. She was a Starbucks employee, taking a brief break from sweeping to chat with a customer. I quickly sat back down, hoping no one had seen or heard me asking for Marci. The real Marci arrived with her tapping cane a few minutes later. I wasn’t sure if she would be completely blind, but I could immediately tell she had some vision from the way she made eye contact with me. She looked to be in her mid-50s with gray hair peeking out of her nice summer gardening hat, white pants, and a gray shirt. We sat and chatted until Marci suggested we move outside to continue our discussion and start the training. We stood up and made our way to the door. I had my cane out for the first time, and followed Marci out the door, not sure how to use this long white piece of aluminum in my hand. Outside I felt thankful for the pleasant weather, and enjoyed getting to know Marci as we sipped our beverages. She showed me some cane basics, and I began to think this day would be better than I had anticipated. We decided to continue our training around the neighborhood, but needed to throw our garbage away before heading out. Marci led the way back into Starbucks to find a garbage can. As soon as we entered, I could feel all the eyes on the two women with the long white canes. My ears perked up, keenly aware of every conversation we passed. “Really makes you thankful for what you have, doesn’t it?” I heard one woman remark as we reached the garbage can. There was no doubt in my mind that she was referring to Marci and me. Another woman was joyfully explaining the canes to her small child, “…and so now you know how people who can’t see can walk around by themselves” she was saying in the same tone that I had used dozens of times to explain difficult subjects to my daughter, trying to sound casual and cheerful. And as we walked out the door, I heard an older gentleman telling his friend about a blind woman he once knew. Our two minute trip to the garbage had sparked all sorts of conversations. I knew that was not a bad thing, but it didn’t feel good either. I felt completely exposed, and I wanted to hide. I soon learned I had to pay less attention to what everyone around me was doing, and start focusing on the task at hand. Learning to walk with a cane took more concentration and coordination than I had envisioned. Right foot goes with left tap, left foot goes with right tap, side to side sweep, but not too high. Right foot, left tap, left foot, right tap, I repeated in my head and tried to stay focused. “You’re moving your arm too much,” Marci coached me, “You really only need to move your wrist, and keep your arm out in front of the center of your body.” This felt like a lot for me to remember and it didn’t come as naturally as I had hoped it would. Marci was kind and encouraging towards me. She also had high expectations and knew instantly if I was not doing the techniques correctly. “You’re still moving your arm too much.” she would correct me. “You need to move your arm to the center of your body,” she continued. “You’re tapping and stepping on the same side.” It reminded me of the one time my husband had tried to give me golf lessons, correcting every element of my form. “Keep your head still,” he would say so many times, and I was convinced I was keeping it still as he continued to correct me, to the point I finally shouted “I am!” at the top of my lungs, and we both agreed golf lessons weren’t the best activity for our marriage. Likewise, I was certain I had it all down, and then I would hear Marci behind me, “You need to keep your arm still.” I was tempted to yell “I am!” a few times, but decided that was not the best way to thank a generous person who was donating her time to teach me. Instead, I offered to treat her to lunch to show my gratitude. As we walked to the restaurant, side by side, canes in hand, it was like a magical “parting of the red sea.” I was elated not to have to dodge people and objects. Most people just quickly stepped out of our way, avoiding us and our canes and giving us lots of space. It was such a nice change from frantically trying not to bump into bodies that seemed to appear out of nowhere. But then I heard a loud voice. I also knew part of my irritability was due to the fact that I really needed to eat some food, so I was delighted when we arrived at the sandwich shop for lunch. It was a casual sandwich cafe where you ordered up at the counter, seated yourself, and then collected your food when they called out your name. These type of restaurants often gave me anxiety because there was a lot to navigate in line, reading the menu from a distance, and then finding a table while carrying a tray full of food and grabbing your own beverage. So I was pleasantly surprised when we entered and an employee immediately came over to us, saying “If you’d like to find a table ladies, I’d be happy to go over the menu with you and bring you your food and drinks.” His helpfulness felt like actual help, and the way he spoke to us was not demeaning or belittling at all. He was making it clear that he knew we were capable of finding our own table, and yet he was trying to make the process of ordering and paying for our food less strenuous. I was exhausted by the late afternoon. It reminded me of traveling overseas, and how tired I would feel at the end of each day after trying to converse in a foreign language. During these travels, I felt a strong sense of relief when I stepped into my hotel room and could turn “off” from focusing so hard on seemingly everyday tasks. I was looking forward to that familiar feeling of relief as I boarded the bus home. My first time felt overwhelming, and exhausting. But I definitely wanted to try again. Each time I used my cane after that day, it got easier and more fluid. I soon found myself moving through life with newfound confidence and freedom. OCTOBER IS NATIONAL DISABILITY EMPLOYMENT MONTH (NDEAM). HERE’S WHAT EVERYONE SHOULD KNOW ABOUT THE VALUE DIFFERENTLY ABLED PEOPLE BRING TO THE WORKPLACE. I recently returned to the field of education after an eight-year stay-at-home-mom hiatus. In addition to the typical reentry jitters and pondering over whether my favorite coral blazer is still in style, some more significant questions surfaced as I signed my contract: How will I travel to trainings and meetings after the closest bus routes to my house were just cut? What if one of my students or parents is allergic to my guide dog? And how many sessions with my accessibility specialist will it take for me to confidently use all the technology required to do my job? As a person who is legally blind, these are legitimate questions to ask, but they’re also relatively straightforward to solve, especially when compared to the invisible barriers people with disabilities face. The concerns that kept me awake the nights preceding my first day of new-teacher training were far more nuanced than transportation hiccups. My mind darted anxiously from cultural stigma to past experiences to potential perceptions, but it ultimately landed on this one question: At this organization, will I be valued for what I can bring or overlooked for what I lack? As an educator with significant sight loss, I’ve had several work-related situations cause me to pause and wonder how to proceed. In my early 20s, after my very first teaching job interview, the principal said the reason he wasn’t hiring me was that my eyes sometimes drifted to the sides instead of looking right at him. I later found out my student-teaching supervisor had called him to say how well I’d done with the eighth graders, explaining that my vision loss didn’t affect my ability to teach. She told him about the system I’d developed for calling on students though I couldn’t see their raised hands, and how I was so in tune with my three language arts classes that I made each of my 90 students an individualized certificate listing their unique gifts at the end of my 16 weeks with them. The principal still chose not to hire me. Neither did the principal at the school where I student taught. Fortunately, a principal in a nearby town was able to look past my disability and hired me to teach seventh grade language arts. Yet consistent positive reviews in my first few years of teaching failed to shield me from others’ doubts. One behavioral specialist didn’t want to place her student in my classroom because she was afraid I wouldn’t keep a close enough “eye on him,” despite that he had an aide who would be there most days. While the student participated well in my class overall, I began to sense that his aide was focused on scrutinizing my ability to do my job rather than on helping this student. Thankfully this was not the sentiment of all my coworkers. I felt supported and valued as a team player by most. But an undercurrent of dissent can poison a sea of supporters when you’re feeling watched and pressured to prove yourself. Fast-forward to last spring when I began applying for jobs after my mommy-hiatus: I was surprised to find that an element of discrimination still exists, at least in the hiring processes of several places in Southern California. The director of a local academy, for example, asked me how I was able to teach with my limited sight. I felt my throat tighten at the bluntness of her inquiry and tried to maintain focus as her hiring assistant sat next to her, sighing heavily throughout the interview, stating at the end of our conversation, “I really doubt we have a place for you here.” I debated not bringing my cane or guide dog into my next interview but worried I would appear intoxicated if I fumbled to sit down. Right about now, anyone versed in disability law is raising a hand to comment, ready to point out that a seemingly small action, like asking someone directly about their disability during a job interview, is illegal and could even be grounds for a court case. I do realize this, but sitting in a courtroom just doesn’t seem like the best use of my time and energy. This is not to say others shouldn’t involve legal action in certain cases of work-related discrimination. I have friends who’ve had to fight to keep their jobs after losing vision, and I wholeheartedly support their efforts. According to recent statistics, 17.5% of people with disabilities were employed in 2015, compared to 65% employment among persons without disabilities. I am convinced that at least a portion of those remaining 82.5% desire to work but are unable to cross barriers into the workplace. As I continued my own job search, I remembered an interaction I had at an Apple store in Chicago a couple of years ago. I was asking about voiceover on my iPhone, and the technician became stumped over a couple of my questions. He apologized and said he’d check with his coworker, an expert in voiceover who used it all the time. “He’s blind and teaches all of us new tricks on voiceover,” he added. His statement gave me a sense of pride for some reason, like the technician without sight wasn’t some employee who everyone had to help but someone who brought unique, needed expertise. Simply hearing about this employee reminded me that I, too, have unique expertise to offer. Being a credentialed teacher, not a techy, I knew finding a cutting-edge school would be more difficult than finding a trending tech company. Yet the explosion of new charter schools in California offered a large pond from which to fish, one that ultimately led me to my current position with an innovative charter school. Since those in leadership typically set both the tone and precedent for interactions among coworkers, I was immediately impressed by how my director conversed with me about my needs. She offered her assistance and support if needed but didn’t hover or seem concerned. Not once has she asked me how I’ll keep up with paperwork, travel to meetings or learn the detailed technology component of my position. Not once has she asked me how I’ll do my job. She hasn’t asked me because she’s focused on something far more important than my disability: what I can bring to her team. While it requires openness, hiring someone with a disability is hardly an act of charity. Yes, incorporating someone who is differently abled often entails accommodations, extra meetings or time in training for both the new hire and others within the organization. There are potential risks and real barriers, but there are also real benefits. People with disabilities are accustomed to finding alternative solutions to difficult questions, because troubleshooting is part of our daily lives. There are strengths I bring to my position because of, not in spite of, my vision loss. I relate with students who are struggling in a way that others may not, and I will not cease searching for the unique ways students show their intelligence, not just the traditional ones our education system deems important. My first day of school jitters reminded me of being a kid. I barely slept a wink the night before classes began. My younger sister is graciously allowing me to crash on her couch while I’m in Seattle for classes every 3 weeks. And she even made me a “first day of school” sign along with all sorts of school supplies and snack goodies waiting for me when I arrived at her apartment. Sisters are the best!!! This is one of those topics that, in an ideal world, would not need special attention. But since we at Doublevision blog believe strongly in educating the public and bringing awareness to blindness related issues, this post is necessary. All these points are based on real actual situations that have happened to us or someone we know. In a society that highly values independence, most adults have their own personal vehicle and cannot fathom otherwise. For those who cannot drive, alternate modes of transportation are necessary, including public transportation, Uber, rides with family / friends, and walking. We often need to put more thought into our transportation than simply pulling out the car keys, but we manage to make it work. Joy recently had this experience at a work training in SoCal. She walked into the training session where a handful of other teachers were sitting, waiting for the morning to begin, and the trainer noticed her guide dog. After saying hello, she immediately asked how Joy had gotten there. While other teachers were met with “How are you?” or “Good to see you.”, Joy was asked to explain her mode of transit while the group sat listening. Silently wave and keep going, hoping they sense your presence and identity. Waving is an automatic social gesture that comes so naturally that it is often hard to control the wave and dash mentality. But it is possible to both wave and offer a short greeting. I honestly did not realize how many waves I was missing until my daughter was old enough to talk, and started asking things like, “Why did you not wave back to the neighbors when they passed by us?” It may not seem like a big deal to wave at a person who can’t see you anyways, but it matters. Social customs of greeting one another are part of how we as humans feel connection in our society. On the flipside, no need to shout and wave obnoxiously to ensure the person has your attention. Asking someone with a cane or a guide dog whether they are blind is like asking someone in a wheelchair if they are paralyzed. It’s not how anyone wants to be greeted, and is a very awkward conversation starter. To clarify, we are usually open to questions, especially if someone is truly curious about vision loss, but a blunt question like that right off the bat feels out of place. How do most people with sight loss want to be greeted? The same as most people, with warmth, kindness, and a few words.